The PCE-PS 200MA verifiable scale for people has a classical design. It possesses a light elevation allowing even weak people to easily get on and off the scale. The PCE-PS 200MA scale for people has a weighing pan coated with a non-skid rubber to place people conformably and safely. The rubber adjusting feet stabilize the PCE-PS 200MA even on smooth floors such as tiles, PVC, etc. We have reduced the weight of the scale to maintain stability. The easy-to-read display is placed on a support to allow proper reading of the weight. The support has a mechanical and electronic integrated height rod. 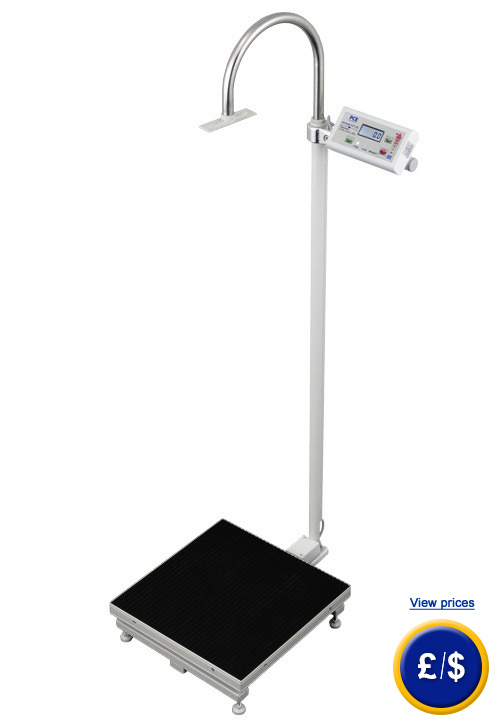 With the PCE-PS 200MA scale for people it is very easy to calculate the Body Mass Index (BMI). 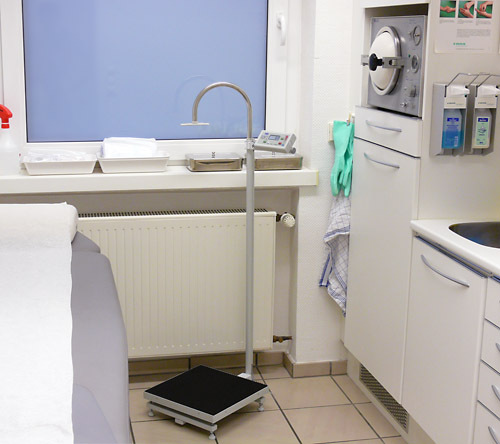 The body mass index is the most widely used diagnostic tool to identify weight problems, whether individuals are underweight, overweight or obese. The verification of scales for people (only for those that can be verified) can be done when scales are ordered or as a reverification. Once an official verification has been done, the scales for people cannot be recalibrated using an external calibration weight. The first verification is valid for two years, but every other verification is valid for one year and must be done annually. Here you will find an overview of all the scales for people. If you have any questions about our scales for people, please send us an email or call us and our engineers and technicians will be happy to advise you regarding the scale for people that best suits your needs. scale for people when it is on. The PCE-PS 200MA scale for people in a medical consultation. 1 x PCE-PS 200MA scale for people with height rod, 1 x mains component, user manual. The kit includes a software for transferring the weighing data to a PC or Portable and RS-232 cable. The transferred data can also be sent to other software such as Excel, etc. The standard software is in English (others are available: French, German, etc). The first verification can be only performed when the scale is ordered. Once an official calibration has been done, the scale cannot be calibrated by means of an external weight. The first verification is valid for 2 years and then annual recalibrations are required.